Shockingly compulsive, this nanny-turned-monster story has become a word-of-mouth international bestseller. Disturbing and profound, it’s one of the most daring and compelling thrillers of our time. A compulsive, darkly chilling investigation into motherhood, class division and power, Lullaby caused a rush of controversy and debate when it was published in France under its original title, Chanson Douce, selling over a 100,000 copies in its first week alone. Myriam, a French-Moroccan lawyer and her husband Paul, a successful music producer, have everything; good careers, a happy home life, two beautiful children. When Myriam decides to return to work after having children, she and her husband look for the perfect nanny for their two young children. They never dreamed they would find Louise: 40-years old, experienced and apparently devoted to her work. She’s quiet, polite, she sings to their children, cleans the family's chic apartment in Paris's upscale tenth arrondissement, stays late without complaint and is able to host enviable birthday parties. Before long the couple are boasting that they’ve found the perfect nanny. 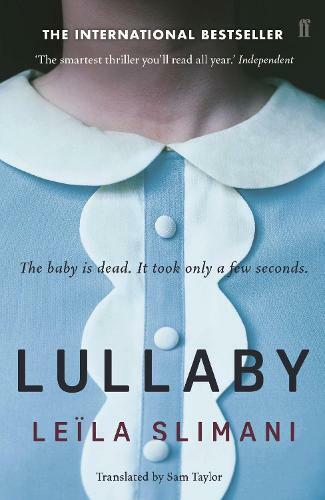 Tapping into every parents worst nightmare – the death of their children – Lullaby is both a tightly plotted, intricately woven thriller and a piercing investigation into society’s attitudes to motherhood, family and individual identity. This novel has got one of the best opening lines I've read for a long time. It is impossible to put it down, takes on every issue; race, gender, motherhood, class. What a fantastic thriller that will send chills down your spine. Slimani's shocking and thrilling novel will have you holding your breath with every page. A paranoid tale of a stressed out mother taking solace in her Mary-Poppins-like nanny soon turns sour.